Last week ReconInForce Beta Testers played over 1,000 consecutive game sessions without a crash. I can’t think of a better way to celebrate this milestone than reminiscing about some of the more entertaining bugs that I came across while creating the game. After all, I think that somewhere inside every developer is a sadistic love for debugging. For me there’s something enticing about slapping on a set of headphones and dropping into an intensely focused hunt for an elusive bug. So without further adieu, I present an ode to the bugs that always kept me on my toes! Yea, send me a Heavy Tank right…um…there. Probably one of my favorite bugs; the deploy anywhere bug allowed a player to drop in any unit on any tile they had ever been adjacent to. The bug was caused by a change in the formatting of the save game file and made for some pretty interesting multiplayer games! Inspiration for another game, maybe? Unbelievably, it took a years’ worth of development and several beta releases before anyone noticed that once the fog of war was uncovered from a tile it never returned. 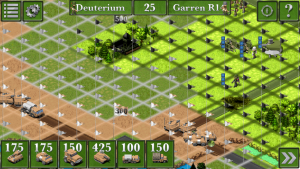 The bug was caused by double-counting visible tiles every time a new game was loaded and meant that players could see way more of the game board than they should. 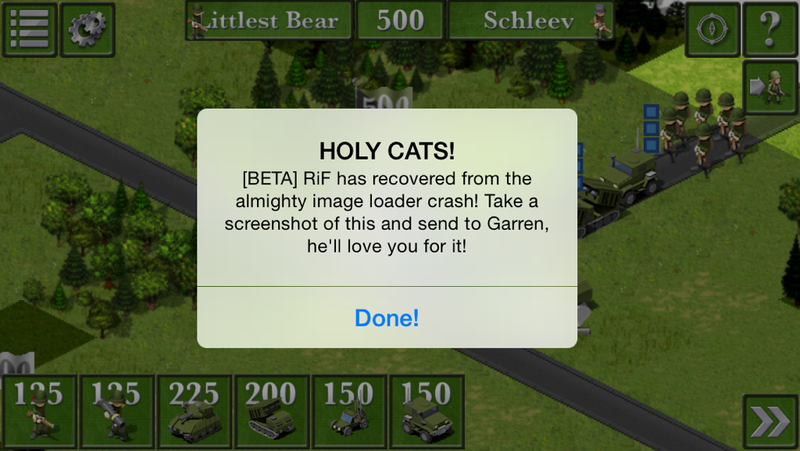 What does “holy cats” even mean??? Throughout the project I had spent several months chasing a very rare crash coming from the game’s engine while loading new sprites into memory. After realizing there was no way I would be able to figure out how to fix the bug, I put in a recover loop to keep the game limping along. The crash was so rare that I also had to toss in a pop-up notification to let me know the recovery was working. 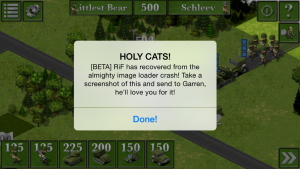 Sure enough, several weeks after installing the fix I received the image above in a text from one of my testers and it definitely put a smile on my face! That’s not a bug, its a FEATURE! While technically not a bug, I had a few scary moments when I thought I was in for a rough one. One of my testers notified me that something was wrong with game’s colors. My first thought was that I was going to be fighting some hardware problems. Then I received the above screenshot and I realized what was going on. The issue was that the game looked so incredibly terrible that the tester had assumed what they were seeing was a bug! I quickly changed over to a less nauseating color scheme. 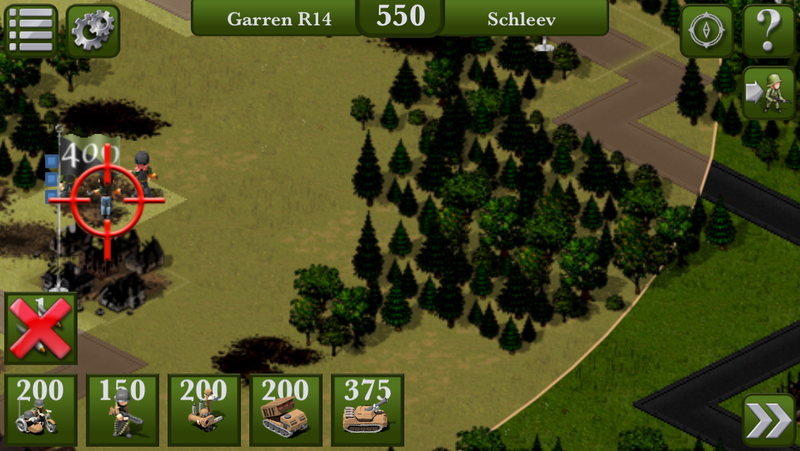 It took some time to re-create the extra special situation for this bug: if a player positioned their soldier right next to the AI’s deployment zone there was a chance the AI would get stuck in a loop deploying the same unit over and over again. 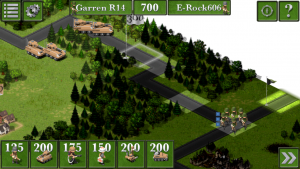 The player’s soldier would destroy the AI’s unit right as it was deployed. Unsatisfied with the number of soldiers it had on the battlefield, the computer would continue to try and deploy the same troops over and over again until it ran out of deployment points. The bug was pretty entertaining and made for an easy win for the player! 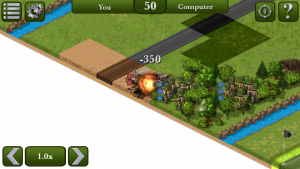 In the more recent game releases the computer will realize the player’s soldiers are adjacent to the deployment zone and bring the troops onto the field somewhere else. ReconInForce is currently in open beta. To apply to become a beta tester just send an email to beta@reconinforce.com. If you find a bug of your own just send me an email: support@reconinforce.com! And don’t forget to follow on Twitter or like the Facebook Page. Keep up the good work, Beta Testers!